Historical Sketch of oldest Mercantile Firm in Madison County. Story of Its Rise, Progress and Success. It is more than half century since Phil. 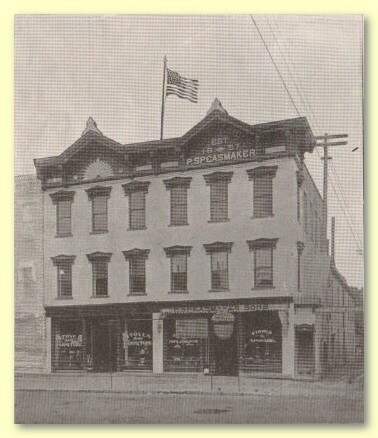 Speasmaker founded the present house of Speasmaker Sons, and until 1894, conducted it with great ability and signal success, increasing his stock, and expanding his field of operations, building a reputation for fair dealing that endures, and is a reich heritage to his three enterprising sons, Edward, William and Carl, who succeeded him. These gentlemen have those sterling qualities of their honored father, supplemented with the modern and progressive business methods that insure even greater success. There is no other place in Madison county where is found so large and varied a line of hardware, agricultural implements, furniture, queensware, house furnishings, harness, robes, blankets, slate and tin for roofing, paints, oils, glass, and tinware. Much of it made in their own shop. Four floors are required to display their stock, besides two large warehouses are constantly in use. Their goods are of the standard, popular makes, so that the customer gets the best in the market. Their policy is liberal, and the vast volume of trade enjoyed shows that they have correct as well as popular business methods. The Messrs. Speasmaker's Sons are worthy in every way to perpetuate the name and fame won by their sire in the business world.